Discover what to eat, and when, to speed up your metabolism and lose weight easily. 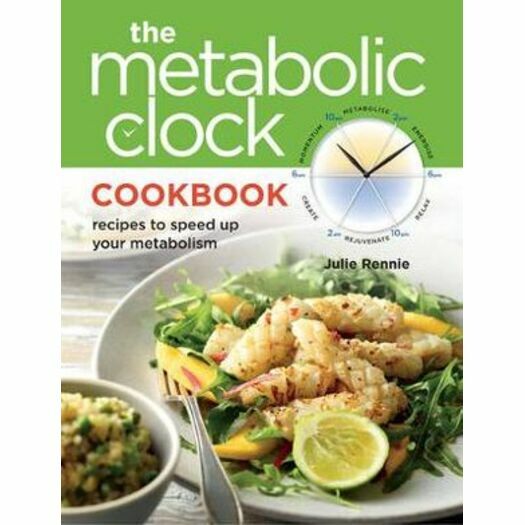 Using the core principles of the successful The Metabolic Clock healthy life plan, The Metabolic Clock Cookbook is filled with recipes that are designed to speed up your metabolism and improve your health. This is an inspiring cookbook filled with nourishing and delicious meals covering breakfast, lunch, dinner, snacks and treats. Keeping healthy and vital is made easy with the simple and nutritious recipes that are family friendly and for those who want to improve their health and energy levels. You owe it to yourself to nourish your body and gain the energy to live life to the fullest. Julie Rennie is an inspirational mentor and speaker encouraging thousands of people to transform themselves and live with optimal wellness. With a background in elite sport and 10 years spent working in the personal growth industry, Julie found herself in her 40s struggling to get a good night's sleep, gaining weight and losing motivation. She then discovered an ancient system of medicine and healing that creates harmony between your mind, your body and the forces of nature. Applying the principles of this ancient wisdom to achieve balance in her western lifestyle, Julie began to lose weight without trying. Speaking to her doctor about this new routine, he directed her to medical research on circadian rhythms. This research verified that our body has natural cycles that manage appetite, energy, mood and sleep. Julie has lived the Metabolic Clock lifestyle and recipes for the last ten years and shares them with readers to help them with organizational systems to incorporate into your life.